After a tight 6-5 win in the season opener at Princeton University on Saturday, Sept. 20, the LIU Post ice hockey team started their 25-game seasonal route in the right direction. Now, the co-educational club is striving to raise awareness and participation from fellow students in order to reach their set goal for the season: to be ranked top ten in their Conference. The Pioneer squad counts 18 at the moment, with a mixture of both locals as well as international skaters. Although the facilities are located in Great Neck N.Y., about a 10-minute drive from LIU Post campus, the team is optimistic to see cheering fans at home games. “We are working on getting shuttles to drive Pioneer fans to the home games during the season, which would make it easy for supporters to come see us play,” sophomore international student Maximilian Riesterer said. 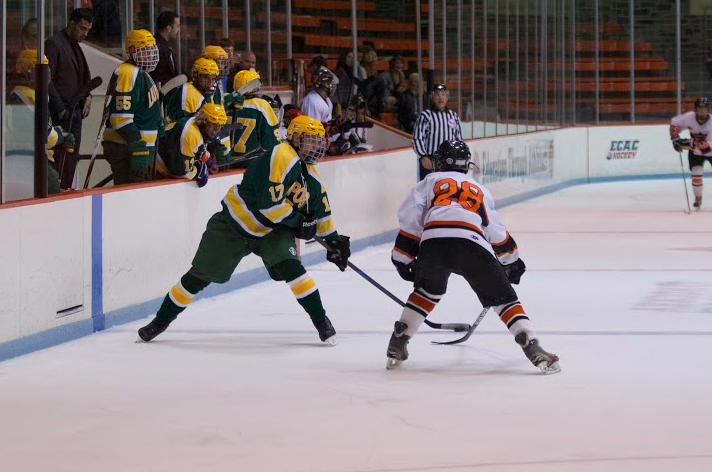 As members of the Division II American Collegiate Hockey Association (ACHA), the Pioneers face teams from the northeast region, within and around the state of New York. Head Coach Mark Peters, with support from four assistant coaches, works hard with the team. They practice twice on ice with two extra fitness workouts each week, excluding games during weekends. While putting the almost daily effort in for each other, the Pioneers not only seek support, but are willing to give some back. 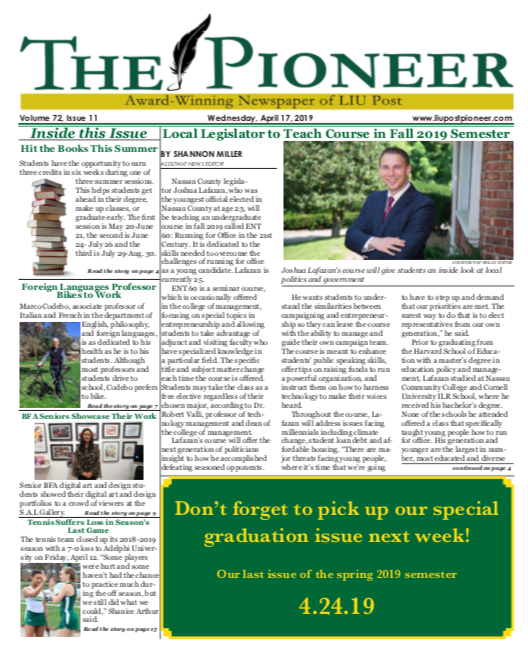 “[Our] team is into promoting charity and [is] willing to support or help any good causes or groups on campus,” Riesterer said. The next ice hockey game is set for Sunday, Sept. 27, from the Parkwood Ice Rink in Great Neck against Wagner College at 10:15 p.m. There is still time to try out for the team, if interested. All levels of skaters are welcome. The cost is roughly $1220 for any new member, which covers practice and game ice time, travels, dues, and the yearly membership fees. Contact Rick.Hamilton@liu.edu to find out more.